I added a written sentiment to the inside using the Easton and P.S. 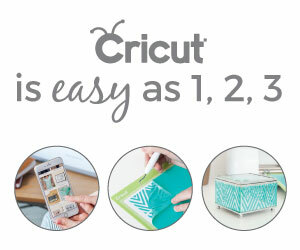 writing fonts included in Cricut Access. I used Cricut Silver Shimmer Paper for the leaves. I like how this design uses print then cut and piecing techniques. I used foam squares to raise the large print then cut flowers. The only thing left to do for the card is to attach the front to the card base. The envelope uses two print then cut flowers and two of the silver leaves. Thanks Lydia, I have made this card and thoroughly enjoyed the whole process. It is very pretty and was well received.